August 29 — The Passion of Saint John the Baptist - Memorial - My Catholic Life! Saint John Vianney was so opposed to the dances held routinely in his small town of Ars that he dedicated a small chapel in his parish church to St. John the Baptist. At its entrance was painted, perhaps somewhat tongue in cheek, a warning of the evil effects produced by lust and drink: “His head was the price of a dance.” Saint John the Baptist’s head was, indeed, the wage rendered by an older man for the satisfaction of watching a young girl dance at his birthday party. More remotely, however, John’s beheading was not caused by a suggestive dance. He paid with his head for poking the bear. John denounced King Herod Antipas, to his face, for divorcing his lawful wife and taking as his own Herodias, his sister-in-law, the wife of his still living half-brother Philip. (Convoluted family blood lines also made Herodias Herod’s niece.) John the Baptist died a martyr for marriage. Herod Antipas was a tetrarch, or one of four rulers, who co-governed ancient Palestine as client kings under the oversight of a Roman governor. Herod Antipas learned cruelty at home. His father, Herod the Great, had two of his own sons strangled to death and ordered the slaughter of all the male babies of Bethlehem to ensure that not one would become the future king who three wise men had foretold. Herod Antipas’ imprisonment and execution of John was more aggressive than his restrained interaction, a few years later, with John’s cousin. Jesus had called Herod a “fox” when some pharisees told him that Herod was plotting his death. Pontius Pilate later sent Jesus to Herod for interrogation after Pilate determined that the Jew’s complaints about Jesus fell more under Herod’s jurisdiction than his own. Herod wanted bread and circuses—for Jesus to perform a miracle. Jesus said not a word, and the fox returned Jesus to Pilate for what always happened next. 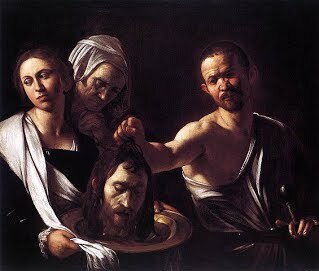 The Passion, or Beheading, of Saint John the Baptist is one of the very oldest liturgical feasts on the Church’s calendar. John’s birth may be the oldest feast. Along with the feasts of Holy Week, the original event of John’s death is right there on the surface of Holy Scripture, and so likely was commemorated as soon as the Church started commemorating anything. John the Baptist’s colorful life on the edge of respectability came to an abrupt end due to the weakness of a weak man, Herod, and due to the revenge sought by the troubled conscience of Herodias, who despised John for mentioning the obvious. Saint Jerome writes that Herodias’s rage was not satiated by the grisly head of her tormentor on a platter. She then stabbed the tongue which had indicted her. Saint John the Baptist, your penitential life ended abruptly when you spoke the truth to power. You did not flinch, vacillate, or equivocate. You were imprisoned and then killed for defending the dignity of marriage. Help us to be as courageous and plain spoken as you. Reflection.—All the high graces with which St. John was favored sprang from his humility; in this all his other virtues were founded. If we desire to form ourselves upon so great a model, we must, above all things, labor to lay the same deep foundation.